The S&P 500 came within inches of it's all time high set back in 2015 this week. 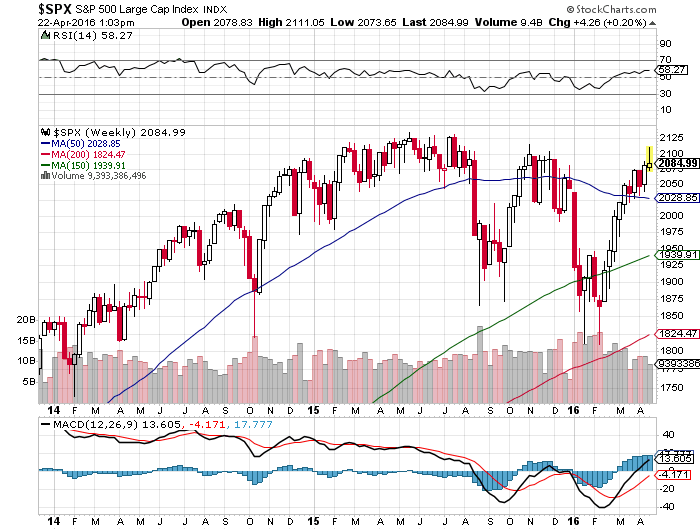 However the market faded towards the end of the week. Regardless it has been quite the run since the beginning of the year. I'd expect the markets to take a breather as players lock in some profits and digest earnings. Speaking of earnings we are about to hit full stride into Q1 results. Some of our companies have already reported. Some good, some bad. International Business Machines(IBM) reported results that disappointed many at first. However the stock recovered after touching the low 140's and hit $150 on Friday. I think the turnaround is really starting to take hold. The company has reported strong growth in it's strategic imperatives which include cloud,data analytics, and security services. I'm starting to wonder if I should make one more add to this stalwart. I have been wanting to add more blue chip protection, and BIG BLUE would fit the description. Phillip Morris(PM) also gave us a report that oddly surprised me. The company increased it's 2016 guidance to $4.40-$4.50. Just in January the company told us to expect $4.25-$4.35. I think that goes to show that the weaker dollar of late is going to boost earnings for companies with large overseas operations. Phillip Morris conducts virtually all of it's business outside the USA. Either way the stock has slowly started to pullback after a recent run to $100+. Boston Beer(SAM) so far has been a disappointment since I started adding a few months ago. I wasn't expecting this one to get me drunk on new highs as I began purchasing, but I wasn't expecting the stock to continue falling flat on it's face(of course after one to many). The downside guidance is not particularly welcome, but if the company comes in at the high end of guidance the stock is giving investors a 4.7% stock yield. Not terrible, but not great. With my average purchase price at $195 the yield on cost is a paltry 3.7%. I'll look to see if the company can turn things around. Visa(V) issued some very good numbers too. The stock took it on the chin, but that is fine. I'm expecting once the Visa Europe deal closes investors will be more comfortable to start entering the stock. Right now anything with Europe related to it seems to carry more risk. This transaction doesn't warrant the same caution in my opinion. I think many want to see how the merger will affect operations towards the second half of this year. Plus don't forget the company expects to generate free cash flow of $7 billion for the year. That's an impressive number. On a side note GPN will be added to the S&P 500 after Friday's close. That might cause some weird gyrations as traders look for quick cash opportunities. That's a nice accomplishment for the company to be considered one of the best. Also McCormick late last week backed out of its consideration for Premier Foods, but then closed on Botanical Gardens for $53 million. That's a small acquisition overall for the company. MKC has pulled back recently. If it can get down a few more points I might add. The ECB had a meeting this week. Mario Draghi stayed the course and emphasized they will continue to do whatever is needed. That's all fine and dandy since European insurers and banks will soon(June) be dumping corporate bonds they don't want. Institutions can sell up to BBB- rated bonds. Of course the proceeds will probably not be lent out as new loans despite the banks claiming otherwise. Also inflation came in at a big fat zero despite the ECB's 2% target. Draghi actually stated in the Q&A the ECB's policy measures are working, but they just need more time! He did note that structural reforms would make the policy measures more effective. In other words ECB policy measures are less effective due to government mismanagement. Seems to me nothing is working out there. Interesting the ECB noted a Brexit would pose limited risks to the economic recovery. So much for all those out there claiming it will wreck Britain and it's trading partners. There is a Fed meeting this week with a rate decision. No one is expecting any changes, but you never know. Just a reminder that Earth Day was April 22nd. Take the opportunity to use less fossil fuels and be mindful of your impact on the environment with your daily habits. That's all for now. Have a great weekend!